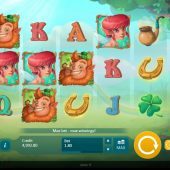 Clover Tales slot sits over a fantasy rural Irish setting, where the Leprechaun snoozes outside his small house in a forest clearing. We couldn't have this theme without a rainbow being involved somewhere or the sterotypical fiddle and pipes Irish folk music as the soundtrack, and I won't disappoint you on either count. In fact the rainbow is crucial to the whole structure of the game as we shall discover, and this is hinted at when we eye the treasure chest underneath it in when the reels spin. Will Clover Tales unlock this chest for you, or will it simply be clover-and-out for your bankroll? 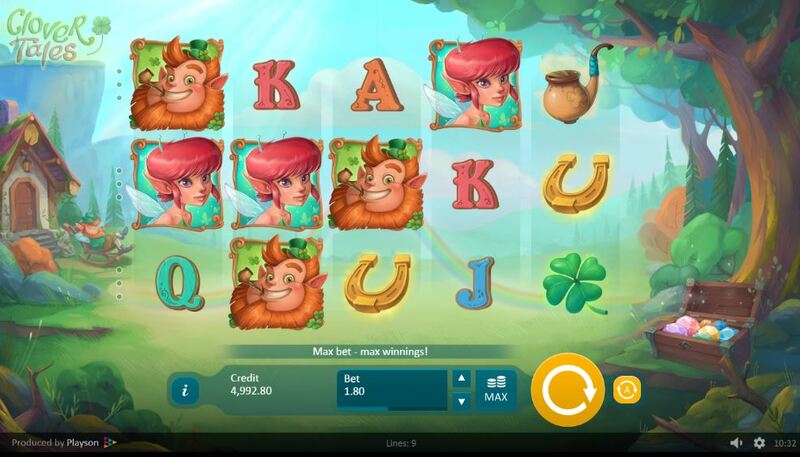 The Pixie and Leprechaun do appear on all 5 reels and a full line of 5 pays 450 coins, then the Horseshoe, Pipe and Clover all award 150 coins. The remaining icons are 4 different card values paying 90 or 60 coins. Now we must get back to the rainbow, as this will explain how we get both re-spin features and both free spins bonuses - and how it's possible to get 5 Wilds! The Wilds on reels 2,3 and 4 expand, but only if they land on the Rainbow Line so for example you can land 2 of which both, one or neither expand. Before each spin the rainbow will sit over one of the 9 pay lines, known as the 'Rainbow Line'. If you get any win on this line consisting of the middle-value symbols of Clover, Pipe or Horseshoe you trigger one of 2 respin modes. The first will turn all winning icons into a Sticky Wild and the reels spin again. So if this was triggered with a 5-of-a-kind, that explains how you can get a full line of 5 Wilds. The second possibility is shifting Wilds, so instead of becoming sticky the Wilds simply disband and move to other postions on the grid for the respin. As above with the Rainbow re-spins but this time we need one of the two higher-valued symbols to form a win on the Rainbow Line. You can receive 5 free games where for each spin 1 to 5 expanding Wilds are placed onto the reels. The alternative bonus is again 5 free spins but with a Wild reel 5 which moves one reel to the left on each spin, finishing on reel 1. You can still get other Wilds appear in both instances. No retriggers, but nevertheless both tend to produce decent returns.